Type: Lithium. 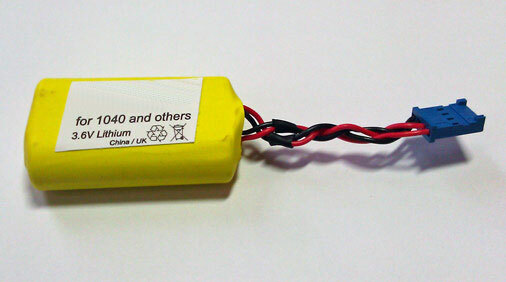 Voltage: 3.6 V. Capacity: 2450 mAh. Height: 51.5 mm. Width: 29 mm. Thickness: 14 mm. Price: £27.20. Postage and packing included. Replaces: NUM 1000 Series CNC batteries and more. This NUM 1000 series Lithium CNC controller battery fits several NUM controllers. It replaces 2xSL360/131. Some NUM 1000 CNC controllers take a similar battery with only two wires. Contact us if you need this version of the battery. This NUM 1000 series PLC battery comes with a one year manufacturer's warranty.